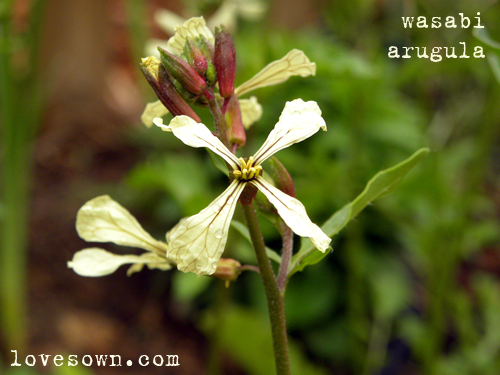 This is a seriously spicy arugula with the most adorable papery white flowers with maroon veins. I picked up the seeds from Renee's Garden. I'm letting this go to seed, but not sure if they will cross pollinate with the one or two other breeds that are also in bloom. CORRECTION: This picture if of just straight Arugula. It still has a lot of bite! I'll plant Wasabi soon and get back to you!